C-TPAT Security Services offers threat assessments for a more than fifty countries and regions that will satisfy C-TPAT requirements. Our standard threat assessments are updated annually or during periods of heightened alert. 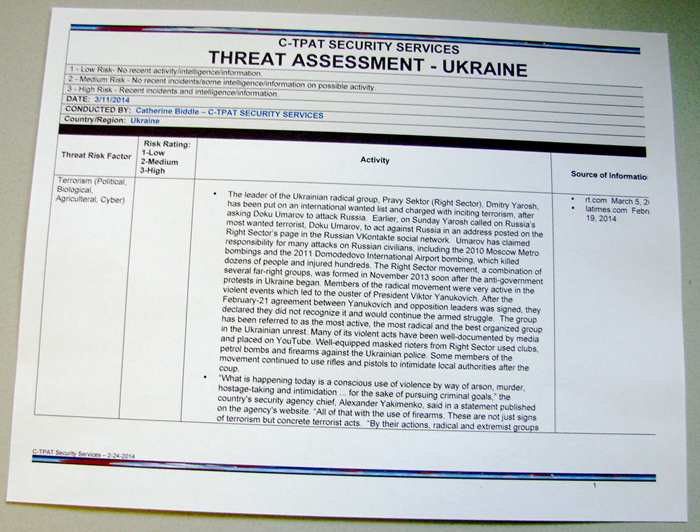 Each threat assessment covers all major factors such as terrorism, contraband smuggling, human smuggling, organized crime, theft, pilferage, hijacking, piracy, and conditions within a country which may foster any of the aforementioned threats. If the country or region you need is not listed, please contact us and we’ll create a fully customized threat assessment for the country or region of your choice.